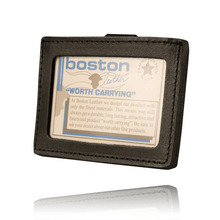 This Boston Leather Clip ON ID Holder is made of top grain cowhide with a plastic window to show your id. It clip on to your belt in a horizontal direction to allow most ID cards to be read without further shifting. Strong steel belt clip will fit belts up to 2 inches in width.